Gillian Anderson's decision to quit The X-Files is final. The star opened up about her decision during a Q&A with reporters at the Television Critics Association winter press tour, explaining that “there are lots of things that I want to do in my life and career." "It’s been an extraordinary opportunity. I’m extremely grateful. [But] I don’t want to be tied down to doing one thing for months and months… I like to be challenged as an actor." Anderson has played the role of Dana Scully on and off since 1993, so it makes sense that she wants to distance herself from the character and try out some new projects. That's not to say she did not do a lot of projects during the time The X-Files ended its original run. In fact, she had acclaimed roles in series such as The Fall, Hannibal and Bleak House. She's an actress who likes to keep busy, and it seems like she wants to continue to switch things up with fresh roles to remain challenged. 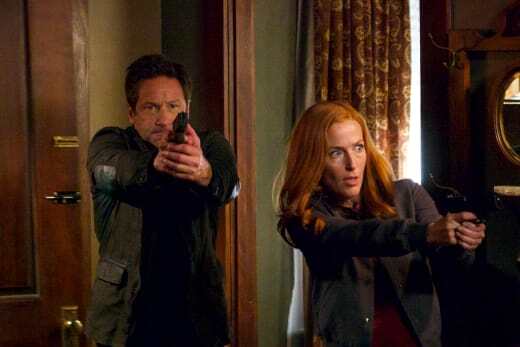 If you're worried about the series continuing without one of the leads, it sounds like The X-Files Season 11 will be the end of the line for the hit series. In addition to exiting the Fox drama series, Gillian also confirmed that she would not be returning to American Gods for Season 2. “I’m not doing any more American Gods,” she dished to reporters. The fate of American Gods has been in flux ever since it was announced that co-showrunners Bryan Fuller Michael Green had left the show. Apparently, there were creative differences between the duo and Fremantle over the length and direction of Season 2. Anderson played the character of Media on the series and won a whole lot of praise for the role. Remember you can watch The X-Files online and American Gods online right here via TV Fanatic. The X-Files continues Wednesday nights on Fox.